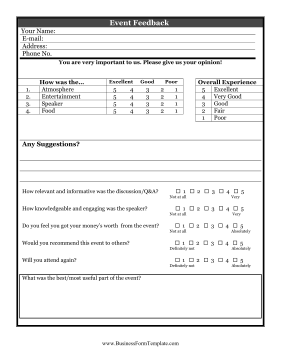 After any event, including a conference, speech, or auction, use this event feedback survey to get suggestions. Fields: Your Name, E-mail, Address, Phone No., You are very important to us. Please give us your opinion!, How was the Atmosphere, Entertainment, Speaker, Food, Overall Experience, Any Suggestions?, How relevant and informative was the discussion/Q&A?, How knowledgeable and engaging was the speaker?, Do you feel you got your money's worth from the event?, Would you recommend this event to others?, Will you attend again?, What was the best/most useful part of the event?